EVOL, Denis Meyers & MUGA seen in the La Louviere exhibition. 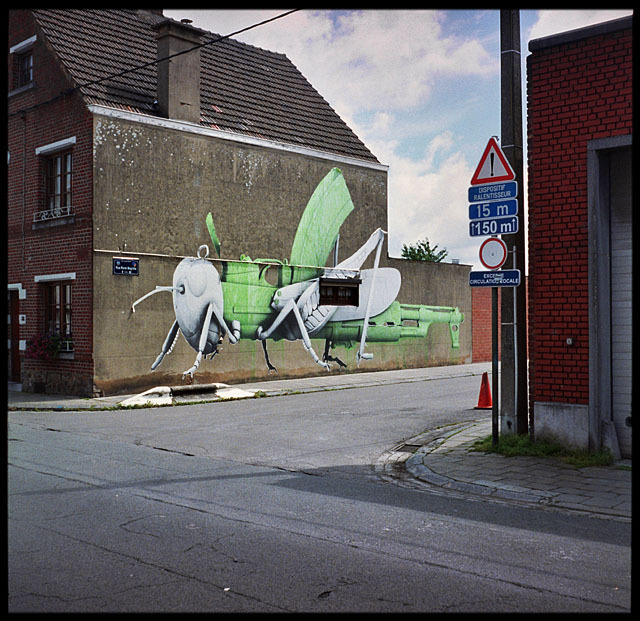 The small town of La Louvière, in Belgium is host to a brilliant Urban Art exhibition being held at “Centre de la Gravure et de’limage imprimée” (The Center for Engraving and the Printed Image). 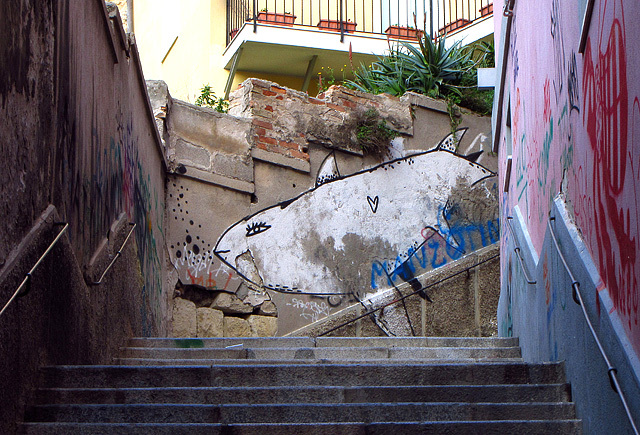 Showing through September 2, 2012, “Vues sur Murs” (Wallscapes: Prints in Street Art) features an impressive list of international artists, many making new work specifically for this exhibit and also hitting the town with huge pieces. While some of the artists knew each other, others met for the first time. “This created some small surprises,” said Bosterhaut. Evidence of this is seen in one of the exhibition’s highlights located on the top floor. There, Berlin-based EVOL has transformed several structural columns, which protrude at various levels into the exhibition space. 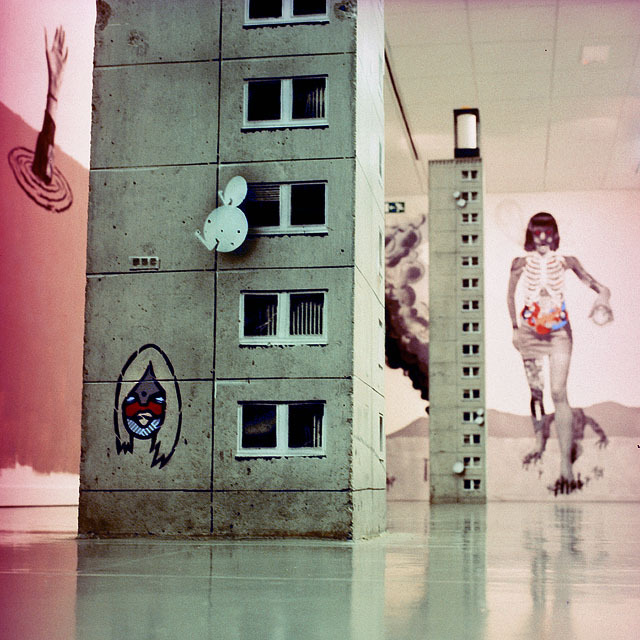 They now appear as EVOL’s signature-style buildings and “artists like Denis (Meyers) & Ludo made some tiny stencils or billboards, creating a kind of interaction between the artists,” Bosterhaut said. Ludo’s mini-billboard seen on an EVOL “building.” The billboard ad disruption on a Kinder Bueno candy box measures about 3 inches high. 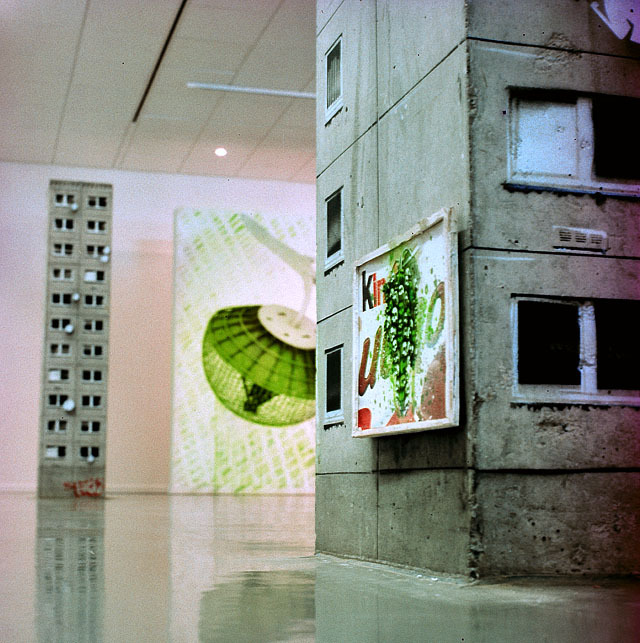 Full size pieces from both artists appear in the background. 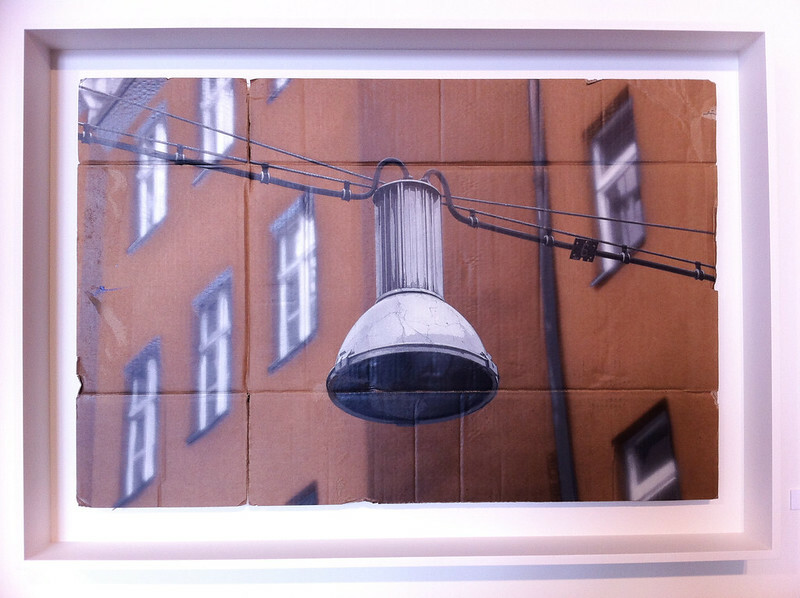 EVOL’s other works include some exquisite urban-themed paintings on cardboard. Another highlight of the show is Brussels-based artist Denis Meyers. 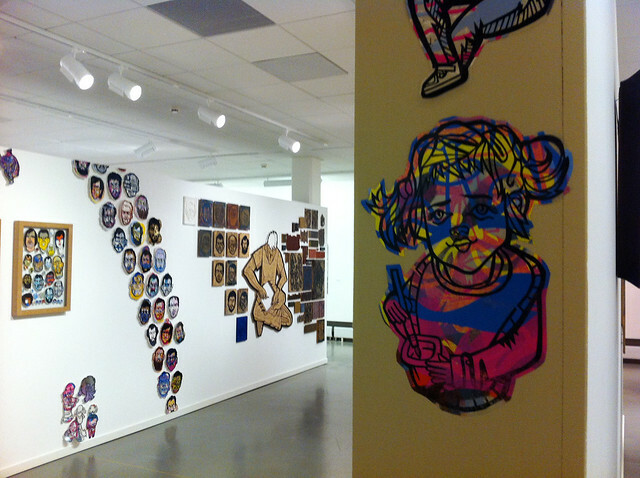 Mostly known for the large faces he paints, he also prints unique stickers and uses hand-made woodcuts and rubber stamps to produce a wide variety of work which all screams out with his signature style. Many of his sketchbooks are also on display as well as other elements which offer a peek into the artist’s process. Just a bit of the Denis Meyers section from the show. Long-time French favorite Jef Aérosol‘s large iconic work greets you at the entrance of the exhibit but some of his smaller, printed images are framed on the sides and offer a more intimate experience with the artist. Jef also hit the town, painting a three-story-tall face of rocker Jimi Hendrix. Jef Aérosol’s work greets you at the entrance. In addition to his brilliant mini-billboard, the Paris-based paste-up master Ludo and his unmistakable green paint occupy a notable section of the top floor, including a full-scale bus shelter (crappy tags included.) For the real experience though, pick up the map supplied at the front desk and follow it to the various “treasures” left by artists around the city. 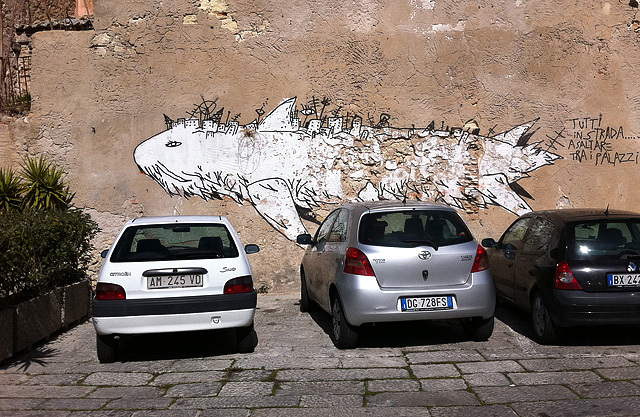 Ludo has posted three large pieces out on the town. LUDO work on Rue René Magritte in La Louvière. 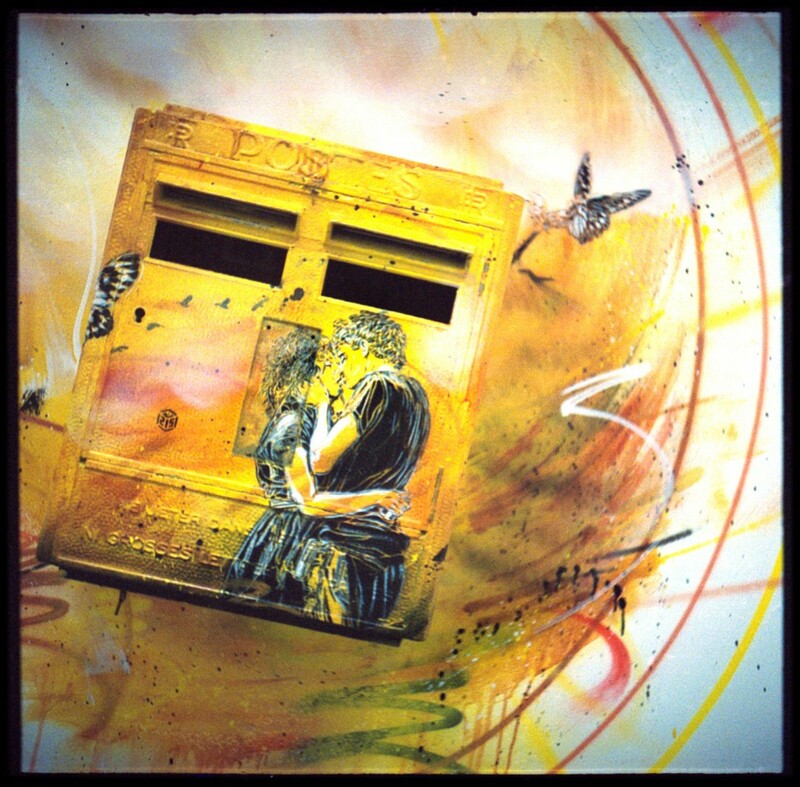 A favorite of mine is “C215” (Christian Guémy.) The Parisian stencil artist painted a large mural for the show. There are also many photographs of his stencil works, and several other painted “objects,” including three mailboxes, a shoeshine box, and a metal sign among other things. 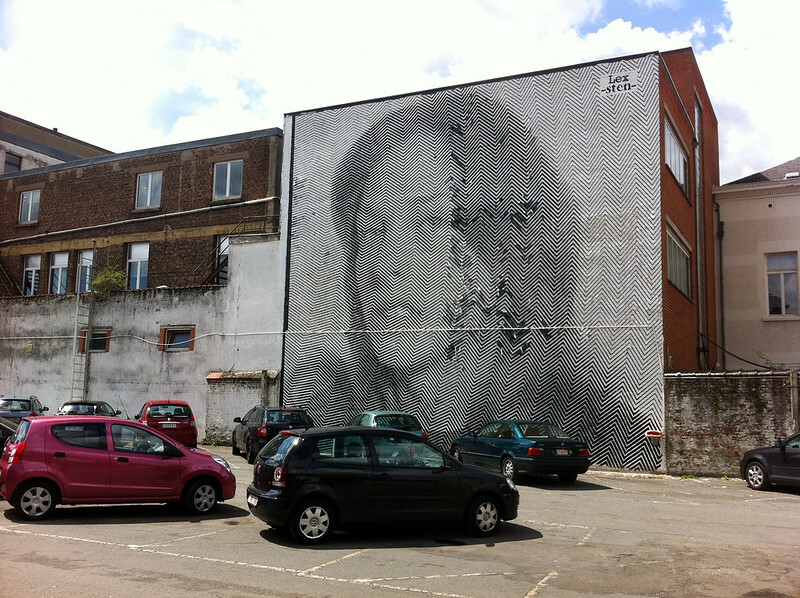 The pioneering Italian artistic duo of Sten & Lex display some of their strong, black & white portrait posters, but the real treat from them requires a 10 minute walk to a parking lot down the road a bit. 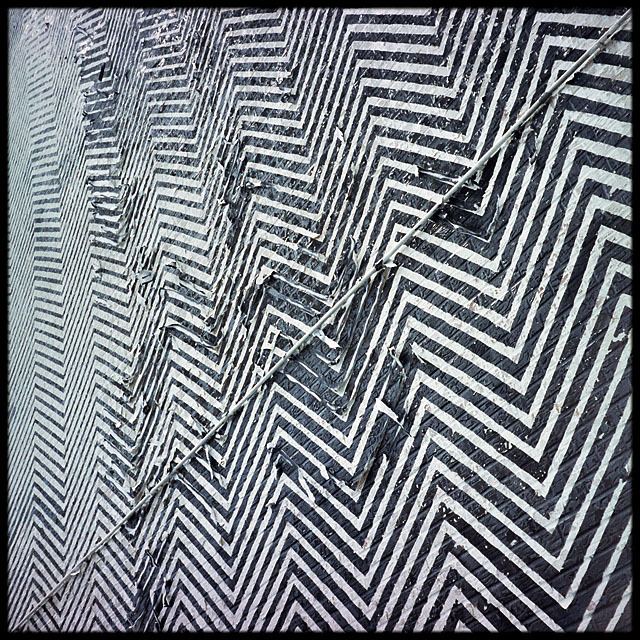 There, a dramatic and elaborate composition of black & white zig-zagging lines reveal a face that fills the wall and towers over the cars and shopping carts. 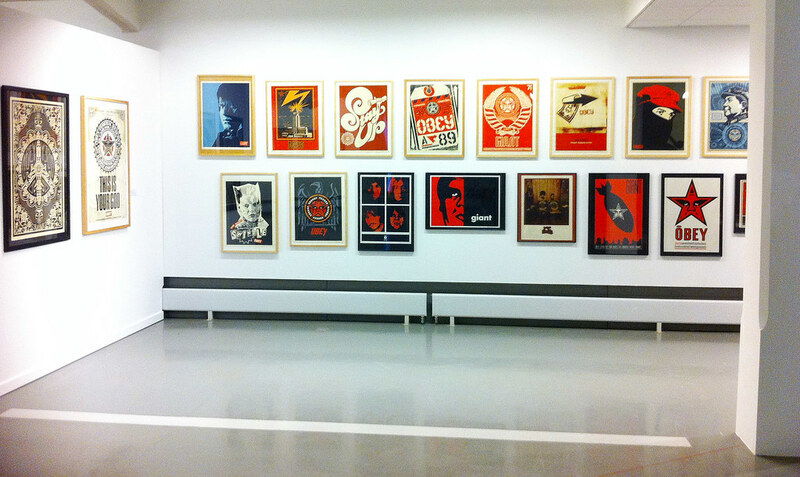 Of course the anchor of the exhibition is an extensive collection of OBEY works by American artist Shepard Fairey. In addition to a short documentary video, the display spans his career from his quirky beginnings making “Andre the Giant has a posse” stickers, to the slick, celebrity and political-themed posters pumped out by the Obey Giant Worldwide Propaganda factory today. There are dozens of his limited-edition prints with their graphically-pleasing imagery, and even a trio of OBEY skateboard decks. A definite treat for any Fairey fan. The show concentrates on the printing aspects of urban art but there’s a ton of other multi-media work to see there as well. 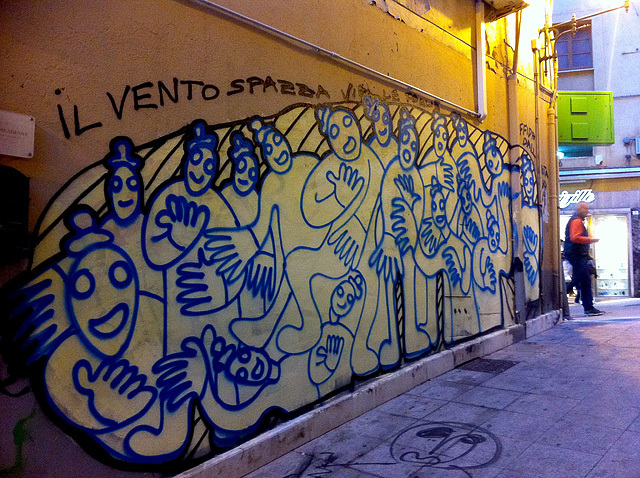 Too much art to mention in this article, including great stuff by Invader, Obêtre, Muga, Doctor-H & Swoon. This is a severely edited version of a much longer story from my newly started blog, LABEAURATOIRE where you can read the whole story & see a slideshow with more than 50 photos. IF YOU GO: Smack-dab in-between Paris & Cologne, La Louviere is about a two and-a-half hour drive from each, and just 45 minutes south of Brussels. Definitely worth the trip. But remember, it’s only showing through September 2, 2012 – so get going!